Featuring interviews with politicians, public officials, thought leaders, writers, artists, and activists, What Will It Take to Make A Woman President? Conversations About Women, Leadership, and Power (Seal Press / November 2013 / $17.00) by Marianne Schnall—a widely published writer, author, interviewer, and the Executive Director of Feminist.com—delves deeply into these conversation-starters and much more. 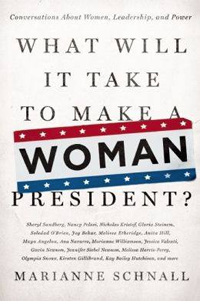 Prompted by a question from her then-eight-year-old daughter during the 2008 election of Barack Obama—“Why haven’t we ever had a woman president?”—Schnall set out on a journey to find the answer, looking at the issues from a variety of angles and perspectives, and gathering viewpoints from high profile, influential people from all sectors. With insights and personal anecdotes from Sheryl Sandberg, Maya Angelou, Gloria Steinem, Nancy Pelosi, Nicholas Kristof, Melissa Etheridge, Olympia Snowe, and many more, What Will It Take to Make a Woman President? addresses the timely, provocative issues involving women, politics, and power at the right time. With a broader goal of encouraging women and girls to be leaders and change agents in their lives, their communities, and the larger world, Schnall and her interviewees explore the changing paradigms occurring in politics and in our culture in order to hopefully move closer towards meaningful and effective solutions—and the vision of a world where a woman can be president. Visit the What Will It Take web site and Join the Movement! "It is, arguably, the most pertinent question in modern political history: When will there be a woman president? When posed by Schnall’s young daughter, the topic took on a whole new sense of urgency. To find the answer, the author and founder of Feminist.com interviewed a dazzling and diverse array of distinguished politicians, journalists, corporate executives, writers, and entertainers. Everyone from Gloria Steinem to Nancy Pelosi, Donna Brazile to Marianne Williamson, Nicholas Kristof to Michael Kimmel, Anita Hill to Kirsten Gillibrand. Through far-ranging conversations, Schnall gained insight into factors contributing to the country’s failure to elect a woman to its highest office and sought advice as to how we can not only better prepare for the next presidential election but create a world in which today’s young women feel empowered to break out of stereotypical roles. The good news is that there is universal agreement among those profiled that the country will, indeed, elect a woman president. The more disconcerting message is that there is still much work to do in order to achieve true gender parity." In Daring to Be Ourselves, freelance journalist Marianne Schnall brings together the most inspiring and empowering quotes from her interviews with many of the world's most interesting and influential women. The result is a compelling collection of insights and words of wisdom on a variety of important issues, including equality, overcoming adversity, aging, finding balance in life, taking care of the earth, and more. Thought provoking, enlightening, and even humorous at times, this book is a valuable resource for women and girls everywhere. "From a lifetime of interviewing diverse women, Marianne Schnall has chosen quotations that address big questions, then clustered them around turning points in life. Daring To Be Ourselves is a gift, a joy and a rescue." "Daring to Be Ourselves is lovely and useful and true." 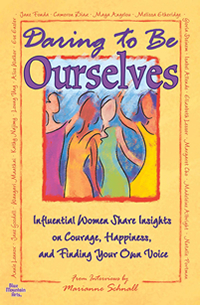 "Marianne Schnall has gathered up a provocative, soulful and deeply helpful book of women, wisdom and ways to move us all forward. It is a gift!" Copyright 2010-16 Marianne Schnall. All rights reserved.